Although Hezekiah Swain built the house in 1790, the building is better known as the home of Maria Mitchell and is preserved to interpret her story. Maria Mitchell's father William bought the house in 1818, and Maria was born there later that year. Mitchell grew up on Nantucket. She became the first female astronomer in America. After she discovered a comet in 1847, Mitchell's international recognition led to many awards and that acclaim enabled her to continue her work. She established the Association for the Advancement of Women and became the first female member of the American Academy of the Arts and Sciences. The house is also important as an example of a vernacular house type once proliferating Nantucket Island. Most examples were constructed between ca. 1770 and ca. 1830. Buildings of this type had four-bay facades with an off-center doorway and chimney placement. The lack of symmetry is even more pronounced by a variance in window width. The Swain-Mitchell House was enlarged by the addition of a new kitchen in 1825; the summer kitchen ca. 1850; and staff quarters in 1933. 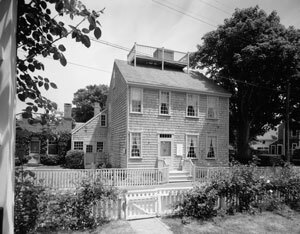 In 1966 the Historic American Buildings Survey documented the house as part of a survey of Nantucket funded by a grant from the Nantucket Historical Trust. The Maria Mitchell Association was founded in 1902 to preserve the legacy of Maria Mitchell, a Nantucket native, astronomer, naturalist, librarian, and educator. The Association acquired the property from the heirs of William Mitchell's younger brother, Peleg, who inherited the house ca. 1850. 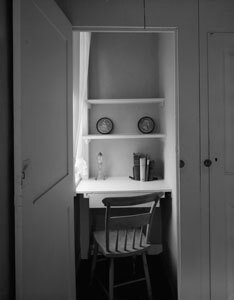 On July 15, 1920 the first permanent home for the book collection, located next to the Mitchell House, was dedicated. The simplicity of the Science Library building has a quiet and peaceful dignity that symbolizes the practical nature of its contents and at the same time the character of the woman to which it is a fitting memorial. On July 15, 1908, the Observatory on Vestal Street near the Science Library and Mitchell House was dedicated. The Observatory, built by the Nantucket Maria Mitchell Association, stimulated local interest in science. The success of the Observatory's programs prompted the construction of an astronomical study in 1922, joining the existing facility with the Maria Mitchell Birthplace. The Maria Mitchell Association provides guided tours of the house and the observatory, as well as educational programs on astronomy and natural science. On the tours visitors are able to see the telescope that Maria Mitchell used as well as her library collection.